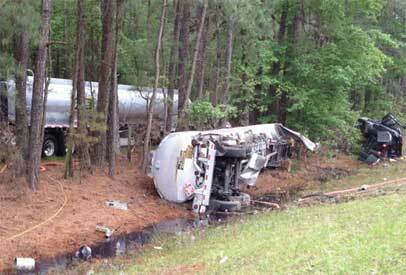 Highlands Environmental Solutions, Inc. (HES) was retained to assist on an emergency response incident involving an overturned petroleum transport tanker near Ridgeville, South Carolina. The subject tanker was traveling Eastbound on a major highway when it struck another vehicle in the roadway. The driver lost control of the tractor trailer, which then left the roadway to the right before overturning and coming to rest in the SCDOT right-of-way. An estimated 7,700 gallons of gasoline were released from the damaged cargo tank (tank trailer) onto the grassy area and the wet weather drainage ditch that traversed the site. HES coordinated and managed response activities, which included the removal of residual product from the damaged tanker, and removal of the vehicle wreckage from the incident scene. HES managed the response, to include expediting an access permit from SCDOT (with regulatory support from SCDHEC) that allowed for the expedited cleanup of contaminated media to include both soils and trees whose root systems had been adversely affected by the release. The excavation area measured approximately 750 feet long along the grassy wet-weather ditch-line, and varied from 15 to 30 feet wide, and four-and-a-half to six feet deep. During site activities, approximately 5200 tons of petroleum-impacted soils and tree debris were excavated and transported locally for proper disposal. 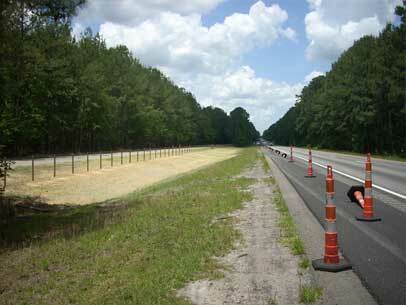 The quick incident response, cooperation by the SCDOT to expedite excavation activities, and the underlying clay soil matrix was instrumental in preventing the product from migrating further into the subsurface. The excavated area was backfilled with clean soil from an off-site source, and the ground surface was hydro-seeded to pre-incident conditions. Remediation activities were completed within two-weeks of the date of the incident. Due to the aggressive remedial measures and efficient project management, the incident received regulatory closure within 35 days of the date that the incident occurred.